NEW YORK (Dec. 4, 2018) – Forbes today announced the 2018 list of The World’s 100 Most Powerful Women. In the 15th year of the annual list, German Chancellor Angela Merkel again retains the top spot for the eighth consecutive year, and 13 times in total. She is followed by U.K. Prime Minister Theresa May, who for the second year in a row has retained the No. 2 spot on the list in the midst of her leadership through Brexit. May is followed by International Monetary Fund managing director Christine Lagarde (No. 3), General Motors CEO Mary Barra (No. 4), and Fidelity Investments CEO Abigail Johnson (No. 5). Samsung Group's Lee Boo-Jin was the only South Korean included in the Forbes' 2018 list of World’s 100 Most Powerful Women. She was placed at 86 on the list. 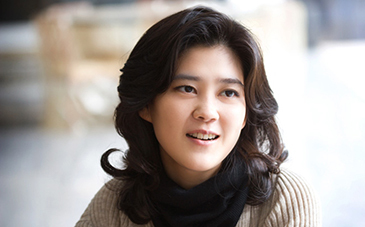 She serves as president and CEO of Hotel Shilla of Samsung Business Group. The 100 women on the list are women who are building billion-dollar brands, calling the shots in the financial markets, crisscrossing the globe to broker international agreements, and provide aid to those in need. Their accomplishments are formidable on their own, and even more so given how difficult it can be to establish inroads into industries and job titles traditionally dominated by men, especially in tech, venture capital, and Hollywood. They are builders, disruptors, and innovators in every sector from business to creative worlds, taking a modern, forward-looking view on power and using their positions to better the world. Members of the 2018 Most Powerful Women list represent women in six categories: business (27 honorees), technology (18), finance (12), media & entertainment (16), politics & policy (22), and philanthropy (5). In total, the Power Women control or influence nearly $2 trillion in revenues and oversee 5 million employees. Nineteen women have made their debut on Forbes’ World’s Most Powerful Women list this year. Notable newcomers include Ana Brnabić, Prime Minister of Serbia, Serena Williams, tennis superstar and clothing designer, Shonda Rhimes, television producer and showrunner of programs including Grey’s Anatomy and Scandal, Maggie Wei Wu, CFO of Alibaba Group, and Shari Redstone, Vice Chair of CBS & Viacom. Notably, Hillary Clinton, who descended 63 spots in the ranks in 2017 at No. 65, did not appear on the list in 2018 for the first time since its inception in 2004. Facebook COO Sheryl Sandberg also dropped out of the top 10 in 2018 rankings for the first time since her list debut in 2010, falling to spot No. 11. First Daughter and Advisor to President Donald Trump Ivanka Trump remained in the top 25, but fell three spots as well to No. 21. 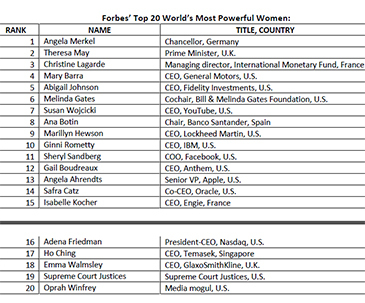 For the complete ranking, methodology, videos and more, visit www.forbes.com/power-women.